Yes, it’s Felix Day, child. 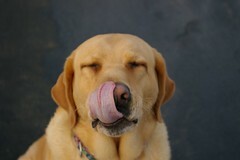 Here’s a dog licking her* chops with excitement. Whoa, whoa whoa, justâ€¦ whoa! He said bad players, all right? Youâ€™re giving up the heart of our order and half of our bench there. It’ll be ok. We’ll trade Lowe, Wlad, and Clement for a seasoned vet like Barry Zito who can help the team win now. And then we can sign Neifi Perez and Desi Relaford to shore up the bench. Bring back Darnell Coles. He had seasoned grittiness. What about Rey Quinones? The guy who dis-appeared one year. Or Greg “Pee-Wee” Briley. Hey, anyone know what happened to the RSS feed? I haven’t been getting mine for a week or so…. We have enough gritty hitters, what is needed are some gritty pitchers. A team needs a minimum of at least 15 gritty players to realistically compete. Frankie Rodriguez was gritty for us before, surely BB can track him down to fulfill our grit quota. You make a great point there. What about 1996 organizational pitcher of the year Bob Wells. That guy had more grit than grit itself. I’m happy it’s Felix Day and all, but I was wondering, when does Hitting Day come? Is there a Hitting Day in the Mariners’ future? Because unless Felix throws a shutout, he doesn’t have a great chance of winning no matter how well he pitches if we can’t hit. And boy, we cannot hit lately. Tui is 21 years old in AAA ball. He’s still got some time left to develop. Bring back Bragg! Alex Diaz! Jose Paniagua!!! At least then I could laugh. 01 pitches for Felix in 4 innings? Bad Felix writ large. That should have been 101 pitches. We now have 0 players batting .300 or above. 160. Whose fault is that? Kenji? MacLaren? Felx? Maybe Stottlemyre? Probably Felix, though. What happened to him tonight?